The tax payer owns a company that sells agricultural implements. The company makes several hundred thousand dollars per year. This is a successful company. The family leads a very nice life; however, they are currently being investigated by The Criminal Investigation Division (CID) of the Internal Revenue Service. The firm is comprised of Certified Public Accountants and accounting professionals. We are not lawyers and we do not represent people before CID. We do have a role to play. We can assist the lawyer in sorting out complicated tax issues; furthermore, if compiled financial statements are needed we can prepare accurate financial statements. We may not represent a client, but we won’t avoid a client that is being investigated by CID. For this particular client, we have prepared many years of back taxes, we have generated compiled financial statements, we have compiled interim financial statements and we have assisted in the preparation of Personal Financial Statements. We have filed all back taxes, and applied for a loan to fully pay all back taxes, penalties and interest. We have helped save a family business that makes a substantial living. This case is a landmark case of tax payer representation. I just wrote a blog article about a client just like this client. The client owns a local ethnic grocery store. The store serves its community as a source of food and as a financial institution. The store offers many financial products, wire transfers, check cashing, Western Union, phone cards and utility payments. The client’s books are a mess. The prior accountant had no accounting methodology, come to find out the prior accountant isn’t even a CPA. In the State of Indiana, you are supposed to be a CPA to issue a compiled financial statement. The client in my blog entry is serving multiple years in prison for not paying income taxes. I don’t think my client is avoiding or deferring income taxes; however, without an accurate set of books and records, how would anyone know? The firm has spent many man hours developing a trial balance and a set of accurate books. We have just completed the accounting and are ready to issue the first set of financial statements. This client is a fantastic success story. The client owns a large complicated company, they now have an accurate set of books. The client was frustrated with his attempts to make more money from his business. When preparing his tax return, he explained his frustration. He ran a small electrical company for the past several years and made a comfortable living. He desired for something more. He was attempting to increase his net income by increasing sales but so far hasn’t seen the results he expected. I asked about his accounting system and how he judged the profitability of each job. We talked about fixed and variable expenses as well as direct and indirect expenses. The client was currently using QuickBooks but not using it’s full functionality. I enabled job costing in the program along with a variety of other items of housekeeping along with a little training. Over the course of a couple of months working together the client, he had a much better understanding of evaluating bid versus actual and the burden of the company’s non-direct expenses. The client is now using the reporting in QuickBooks daily to help manage his company. He has even done projections for the current and subsequent years. The company has a plan that is now numerically represented in the form of projections. The owner has a much better handle on how to measure and evaluate results allowing him with more time to grow his top line but more profitable. We now schedule a quarterly meeting to review results and discuss a variety of business related matters. 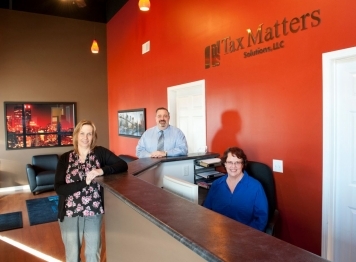 Many clients of Tax Matters Solutions have been clients for many years. During our relationship, the client will experience good times and bad times. Many clients will discover problems when their accounting staff, terminate their employment. One of our long term clients terminated his controller. Unbeknownst to our client, none of the bank accounts had been reconciled. Essentially, the employee had performed few if any accounting related tasks for nearly a year. Tax Matters Solutions was brought in to help reconcile 10 bank accounts and 8 credit card accounts. Tax Matters Solutions helped the client to streamline his accounting functions. The client now spends less time performing accounting functions and he has 1 fewer employees on his payroll. Since the client has had more time to focus on growing his business, sales are up nearly 50%.